When this triple bill was announced last autumn, the name which caught my attention was that of Erja Lyytinen. I’d seen the Finnish guitarist and singer last year in Chester, after a glowing recommendation from a Facebook friend and occasional music writer. Having wowed me with her guitar playing as much as her vocals, I was pleased to hear she’d be back in early 2018. 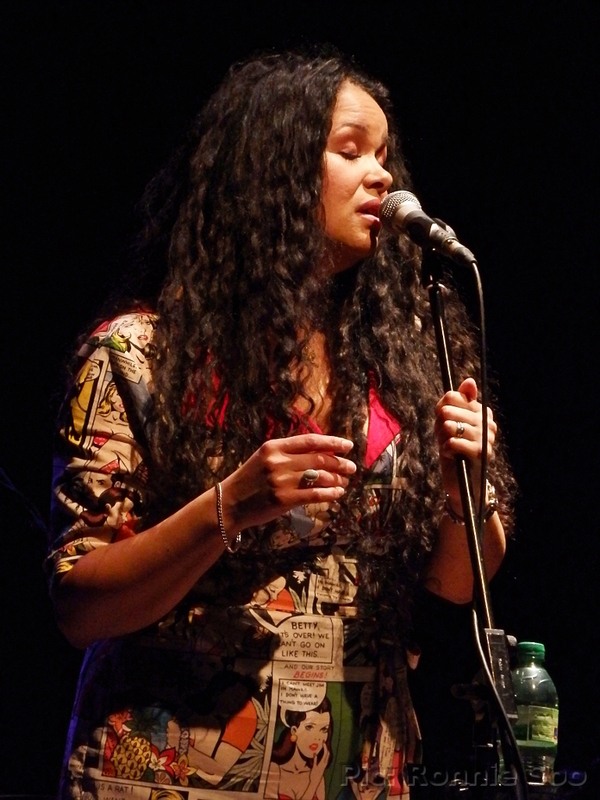 The other acts on the bill were veteran British ‘blues shouter’ Connie Lush, whom I have seen before, and Kyla Brox, whom I hadn’t. The Atkinson complex includes an art gallery, a theatre and the ‘studio’ performance space, where this event was to be held. The floor was set out with tables and chairs, completely unreserved so it was a case of picking the best chair still going! Had I known, the balcony upstairs would have been a better option as that was made up of conventional rows of seats. The three performers have been rotating their slots on this tour, and for this show (the last date of the run) it was Erja Lyytinen who was up first, coming on stage at 7:30. The only one of the three ‘ladies of the blues’ who played guitar as well as singing, she introduced herself with a lengthy piece of slide guitar. Her take on the blues is more my flavour, with plenty of guitar fire and soloing, particularly on the epic ‘Black Ocean’. This time around I was better able to hear her vocals; at Chester last year her guitar did tend to overpower her voice but here it was a better balance. She has a very powerful range, at one point even stepping away from the mic to deliver vocal lines. When she really reached for the notes, she was reminiscent of Lzzy Hale – if she were to change tack and play blues instead of hard rock/metal! Most of what she played came from last studio album ‘Stolen Hearts’ although she did perform new single ‘Without You’. I got the impression many here (certain agers, much like your correspondent!) weren’t familiar with her beforehand, they certainly knew all about her 50 minutes later! Next up was Kyla Brox, and when I saw her I thought at first she was American – a tall figure with long black hair and wearing a dress with comic book panels printed on it (I couldn’t read the comic panels from my spot!) and in possession of a mighty voice, she made me believe she was from the Delta, until she spoke. Her accent soon revealed that it was more likely to be the Irwell delta, since she and her band actually hail from the Manchester area! She and the band weren’t working to a set list, and took one request from an audience member (‘Don’t Mess With My Man’), performing it on the spot. This band leant more towards the jazzy side of blues, but still featured an impressive guitarist in Paul Farr, and bassist Danny Blomeley (Brox’s husband), who got a bass solo of his own during one number. Her set ended with a cover of Leonard Cohen’s ‘Hallelujah’, where she let loose the full range of her vocal power. Her set was a mix of her own material and some covers, including ‘No Regrets’ where she gave a shout-out to its writer (Tom Rush). Like Kyla Brox’s set, her performance was more purist blues but delivered with that sense of fun throughout. After her main set, she brought back Kyla Brox and Erja Lyytinen for a finale where the three first sang acapella, then the band came back on for a cover of the Rolling Stones’ ‘Satisfaction’ with all three singers taking turns. Although I’d come along for Erja Lyytinen primarily this was an enjoyable night of music from all three acts, each had around 50 minutes to do their thing. For £18 it was good value too, and if this format is repeated in future will no doubt be successful once again. Yes that’s right. Me, a self-confessed, dyed-in-the-denim rocker, at a gig from a country singer! I can’t say I’ve ever been a fan of the genre, but that’s probably because of the mental images the very word ‘country’ still conjures up to people like me, who aren’t devoted followers. If you’re thinking Dolly, Slim Whitman, line dancing and yeehaawws everywhere, that’s just as stereotyped (and as outdated!) as thinking of mullets, denim & leather, patchouli oil and stretch jeans for your average Metalhead! Today’s country music is as broad a church as is possible to get, you’ve got your gentle ballads yes, but there are also hard drivin’ riffs, big drums, showmanship and arena productions to rival any major rock band. It just depends on the band you watch, but the main thing is that the music still deals largely with topics about everyday American life. Around this time every year there is the Country2Country festival, which aimed to bring over some of America’s biggest stars in this genre to British audiences unfamiliar with these artists. As the event has grown, it draws fans from across the UK, and has now spawned two more festivals; a Glasgow event and also one in Dublin. Sarah Darling was one of the acts who performed at that festival, and scheduled a UK tour to coincide with that appearance. All well and good but what was a headbanger like me doing here? Aside from my blog disclaimer that I’d write about music of any style of course! A friend of mine who is also a frequent gig-goer was coming to this show, travelling all the way from the East Midlands on a Sunday to boot, so given that he’d made such an effort I reasoned that this performer must be worth a look, whatever her musical style. So, despite my knowing little to nothing about her, I booked for the gig that afternoon and headed into town. We were first in the queue and thus when the doors opened at Studio2 we had the pick of the spots. Right at the front was a tempting-looking sofa and so that got occupied straight away. With plenty of mood lighting (the venue is a former recording studio; the Parr Street Studio complex still includes recording facilities) this was a setting for a chilled-out evening of music. First up was support Kiol, which I thought was a duo (two guys brandishing acoustic guitars ambled up on stage together) – no, Kiol is a solo artist, accompanied by Federico Puttilli who was backing him. Kiol is just 20 years old but performed with an assurance of someone much older. The two of them played a short set of acoustic numbers which still gave the young Italian scope to get the audience clapping along or even stomping (I could see from my privileged position he was using a stomp box to add bass drum where required). The set reminded me a little of Dan Reed and Danny Vaughn’s recent acoustic show I saw recently, a similar feel to it. At 9pm four fellas jumped up on to the stage and began playing, the band consisted of a lead guitarist, another who played acoustic guitar or keyboards, a bassist and a drummer who was stuck in the corner behind an acoustic screen. They struck up, and within moments Sarah Darling herself appeared to cheers, as she walked through the audience and to the stage. Opening number ‘You Don’t Have To Be Lonely Tonight’ was one of the more rousing numbers, complete with guitar solo from Dean Roberts and really hard-hitting drums from Chris Allan. It was easy to understand why he was behind that screen! It turned out her band were all British guys, presumably recruited for this run of shows; the line-up was completed by bassist Alisdair MacLachlan and keyboardist/acoustic guitar player Ash Cutler. All played to such a high standard you’d have been forgiven for thinking she’d brought the lot over from Nashville! The whole vibe of this show was chilled out, and her songs actually touched on more than just country. There were jazzy and soulful parts, and a surprise choice of covers. One song she said affected her lyrically was ‘Please Please Please Let Me Get What I Want’; which she performed this evening. That song (a cover of The Smiths) appears on her latest album ‘Dream Country’, as did much of the material she performed tonight. There was also humour with the song ‘More Issues Than Vogue’, which got the audience chanting along to its ‘whoa-oh-oh’ refrain. She ended proceedings with ‘Stargazer’ – nothing to do with Ritchie Blackmore or Ronnie James Dio, but her own gentle song with which to close the show. This was a world away from what I normally watch live but still extremely good; she had the band, the easygoing charm, the voice and above all the songs. The setting added to the personal feel of this show, but there was an honesty, a natural vibe to this show that isn’t always apparent at bigger gigs on larger stages, from ‘major name’ acts. She did let slip that she was planning a return trip in October for more UK dates and as she also added that this date was a sell-out (it must have sold out on the day) she may well wish to revisit Liverpool. Even if she does jump up to larger stages (the Philharmonic Hall across town would suit her perfectly, for example) I believe she’d still retain that charm which even won over your hard rockin’ correspondent! Following the set she was immediately at the merch table to do a fan meet and greet, I got the opportunity to say hello (and pick up a copy of ‘Dream Country’ for her to sign for me). She was surprised that a rock/Metal fan would come along but pleased all the same, she was extremely charming in person as well as on stage and she will no doubt be playing to more people next time around. When it comes to guitar playing prowess, I’m closer to Dave Lister than Dave Meniketti (for you Red Dwarf fans!) That didn’t stop me from taking a short run up the M57 to the Park Hotel on the outskirts of Liverpool, for this event hosted by local guitar retailers Sound Affects. Paul Reed Smith is an American guitar luthier whose instruments have been played by many leading rock musicians; to name but a few, Mark Tremonti and Myles Kennedy of Alter Bridge, Zack Myers of Shinedown, Rich Moss of Stone Broken and former Whitesnake guitarist Bernie Marsden. The event was held partly to launch the Silver Sky guitar, a model produced in conjunction with John Mayer which has caused no little controversy for it’s (intentional) resemblance to a classic 1964 Fender Stratocaster. On entering the Aintree Suite at the hotel, we were invited to enter a prize draw to be held later in the evening (to win a PRS acoustic model), and there was a display of various PRS models for enthusiasts to pore over, ranging from affordable to stratospheric in price! Sound Affects had listed all of them at their retail price as well as a specially-discounted ‘show price’ to tempt those who might have been looking for a new guitar. All of them looked beautifully-made, and would have tempted even me, were my pockets sufficiently deep to indulge! Following the obligatory browse around the guitars on display we were led into the other half of the suite where the talk would take place, and Paul Reed Smith himself was introduced to the packed hall by one of the Sound Affects guys. He chose to deal with the issue of the Silver Sky guitar first of all; he’s well aware of the internet firestorm that has surrounded this model and was suitably dismissive of the web naysayers! He demonstrated it with a quick playthrough, and described (in some detail) how they worked alongside John Mayer to get it absolutely right. Some of his talk was a little technical for me, though when he explained sustain and how the classic guitars of the old days ‘sustained’ much better than comparable instruments around today, even I could get that! He asked the assembly whether anyone had owned a classic ’63 or ’64 Strat, one audience member put up his hand and was immediately handed the Silver Sky, to ask how the neck felt. That’s something that was a little ‘over my head’ as a non-player; the guy who was handed the Silver Sky did verify that it felt very close to his own ’64 Strat though. Paul Reed Smith was accompanied by Paul Miles, who oversees the company’s ‘Private Stock’ line of custom guitars. The Private Stock line is their version of ‘Custom Shop’; guitars built to order, even in the colours of your choice. Paul Miles gave many examples of customers coming up with colour requirements based on a sunset, for example, or even a purple balloon held up to a light! The two of them had also brought along several pieces of wood, which wouldn’t have meant much to me but these were to illustrate what sort of wood they use in their instruments. These had quite prominent grain patterns, which is evident in their finished guitars, but again this was rather beyond my scope of knowledge so I was happy to bow to their expertise in this field! Following the talk the two Pauls mingled with the assembly before Paul Reed Smith did a photo and signing session (several people had brought their own guitars to be signed by the head of the company which made them), meanwhile they had made the Silver Sky available for anyone who wished to try it. I had to have a go – to my amazement, I found I could play those difficult barre chords much more easily on that guitar than I can on my own instrument. The guitar felt beautiful to hold and play, and it was a privilege to try it out. This was a thoroughly enjoyable evening, it was a pleasure to hear one of the world’s leading guitar builders talk about their instruments. I might even have to pick up my own guitar and try once more to get the hang of it, then there’ll be good reason to save up for one of these beautiful instruments! Halfway through the opening number of headliners The Men That Will Not Be Blamed For Nothing’s set, and their guitarist stopped dead mid-song. Spotting that the (admittedly sparse) crowd was dotted around the floor, he demanded everyone move to the front, in front of a line in the floor ‘or we won’t play another note!’ When he singled out your correspondent for not complying, he lost me there and then. Having decided I wasn’t going to be bossed about by some fella that I’d never clapped eyes on before, who was in Alice Cooper-esque face paint, I proceeded to step further away from the demarcated ‘line’ until I was back at the bar, or even sat down on the sofas to the side of the hall from where I watched the remainder of their set. Of course, I wasn’t here to see that band, though I have to admit grudgingly that their set of punk fused with metal, laced with doses of anarchic humour, was pretty good. Had the guitarist not rubbed me up the wrong way so soon into their set, I might have taken closer order – but no, I was here to see Bristol ‘party punk’ trio IDestroy who have just released a new EP ‘Pure Joy Of Life’, which received an encouraging review in Kerrang! mag. I’ve seen this band numerous times over the past 18 months or so, mostly in tiny venues, and was looking forward to their appearance on a bigger stage. Opening with their eponymous song ‘Idestroy’ they immediately launched into an unrelenting set of power pop/punk anthems. Vocalist/guitarist Bec Jevons soon took command of this stage and the crowd, which was increasing in number at the front as the set progressed. Most of their repertoire to date got played in this set, all five tracks from the new EP including their cover of the Gossip’s ‘And You Know…’ plus ‘Annie’ and ‘98%’ from their double ‘A’ side single of last year, as well as material from their earlier EP. They have the players, they have the frontwoman to engage any crowd and most importantly, they have the songs. Many of these songs are laden with hooks as well as powerchords, so you’re singing them back to yourself at the bar later, or even on the trip home. When you have a talented songwriter in your ranks as this band do, you’ve got a chance. This was their first appearance in Chester, and they’re welcome back here (or to Liverpool – I keep asking them, haha!) – any time. Following this tour IDestroy will play dates in Continental Europe, and there will doubtless be more UK appearances later in 2018, around Becky Baldwin’s (she is also a member of international all-girl rockers DORJA, and UK metallers Fury) other commitments this year. When they come around again, get to a show if they’re anywhere near you. Being one who frequently gets irritated at the lack of gigs in my city, it was a bit of a bummer to be forced to stay in on a night one happened! I couldn’t go to Hangar 34 and see Skid Row with Toseland and Bad Touch as hoped on the night before this show, owing to real life intervening, but it may have been for the best since all these gigs are taking their toll on my pocket! Fortunately March seems to be as mad as October these days for live bands playing, and this gig swiftly followed the one I was forced to miss. REWS are yet another band I only found out about recently; a duo comprising guitarist Shauna Tohill and drummer Collette Williams (both contribute vocals) who have gained a reputation for their live shows. Described as ‘the female Royal Blood’ by BBC 6 Music’s Mark Radcliffe, that’s probably as much a millstone as it is a compliment. They’re far from the only pairing who have picked up the gauntlet thrown down by Messrs Kerr and Thatcher of course, but they have their own identity. The setting was in the basement of the Shipping Forecast, around the Ropewalks area of Liverpool where there are many bars, and with this night being St. Patrick’s Night you bet the streets were filled with Guinness hats and revellers draped in the tricolour! It was also a bitterly cold evening, which didn’t seem to put the partygoers off one bit but for me, I just wanted to get into this venue in one piece! I got in to find openers Bribes already on, a local trio whose guitarist also took lead vocals. Their sound did rather overwhelm their surroundings, and it took the edge off their set for me – everything tended to meld together. If their guitar was a bit less ‘Iommi’ I might have got a bit more from this set, as it was I just about managed to spot that one over-driven guitar riff was a lift of Mötley Crüe‘s ‘Looks That Kill’. Maybe in a venue with a bit more space they’d come across better. Next up were St Helens ‘jangle pop’ outfit Scarlet, a quartet headed by Jessie ‘Scarlet’ Robinson. They’ve been around for a few years now, though this was the first time I’d seen them live. Their recorded material is a bit too indie-lite for my Metallic tastes but live they have more ‘wallop’, courtesy of guitarist Adam Cunliffe and drummer Conor Williams. It was the latter who stood out for me in this band, with some nifty drum patterns. REWS spent quite a while setting up on this small stage before striking up, doing so with a cheery roar from Shauna Tohill. Being Irish herself, the occasion (plus, no doubt, Ireland’s Grand Slam win in the Six Nations) must have put her in good spirits for this show, which she revealed was their first in Liverpool. Opening with ‘Let It Roll’ she and Collette Williams quickly got into the groove. ‘You’re all very shy’, she remarked to the crowd who took a little while to warm up, to be honest but the pair did get a few at the front to shake their booties (and play air guitar or even drums 😉 ) as the night progressed. 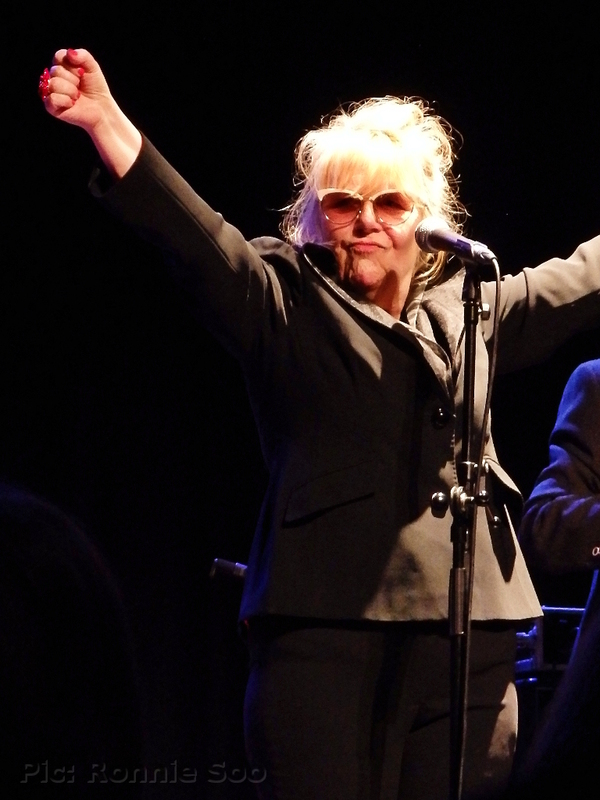 With only two people, you need a good drummer to drive the whole thing along and Collette Williams is certainly that. She provided strong backing for her colleague, who frequently swapped between her two Telecasters and had an array of effect pedals to change the tone of those axes. Vocally, they sounded excellent, the voices blended so well. Using a lazy comparison of my own, they reminded me a little of South Africa’s The SoapGirls – they had that same fuzzy guitar attack and strong lead vocal. The closest they get to that ‘Royal Blood’ sound is probably with ‘Miss You In The Dark’, that one is reminiscent of the Bloodsters. By the end of this year REWS will be known to a lot more people and be playing much bigger places than the basement of a pub, so it was good to catch this duo on their way up to the o2 Academies of this world and beyond. Hopefully they’ll return to Liverpool a few more times before they make the leap to those bigger stages. This venue is new to me, despite being sited in my city. It’s set back from the road (on Hardman Street, close to the Philarmonic and the university area) opposite Magnet, a venue which is soon to cease hosting gigs. Going off this visit, the Buyers’ Club could well fill that gap in the city’s live scene. A small but not claustrophobic upstairs room, there’s a pretty good stage and PA, with room for moving (and moshing, as I would find out!) with a merch table to the back and a small bar. I reckon it could handle up to about 200, by my estimation about 100 showed to this gig and there was plenty of space. When I got in, openers Nervus were coming to the end of their set. I’d have to catch these again on another night, although they sounded loud and rocky enough I didn’t see enough to make any sort of call about their music. Next band up were FangClub, a trio who played loud shouty rock anthems, whose vocalist/guitarist played a Fender Jaguar and had shoulder-length dyed blonde hair. If he were left-handed, and the bassist a bit taller, they’d have had me thinking I was Sam Tyler and I’d travelled back to 1991 (!) They did look – and sound – close to a rather more famous trio from Aberdeen, WA but played with enough fire to get a moshpit going among the youthful element of this audience. As that certainly doesn’t apply to me any more, I got out of the way of one over-enthusiastic kid’s flailing limbs sharpish and watched this set from further back! Obvious comparisons aside, these were a good live band and worth a look when they come around again. Indirectly, it was a dodgy curry that meant I came to this gig. Not consumed by me, but by Little Caesar vocalist Ron Young following his band’s show in Manchester. They were supposed to play at the Live Rooms the next night, but the gig was cancelled on the morning of the date after he suffered what we shall diplomatically call an ‘upset stomach’ (!) Putting aside my disappointment at that (they’re a band I have yet to see although I’ve been a fan since 1990), when I contacted the venue they advised that as I bought the ticket there, I’d have to return in order to get a refund. It was easier to do that at another gig, and as this gig came along a few days later, the refund was promptly used to take in Sumo Cyco instead! I’ll readily admit that the Canadian hard rock/punky foursome are one of those bands I’ve heard of, but not a lot by. Several friends of mine do know about them however, and I found a few of those had come to Chester for this gig. Openers were Skarlett Riot, a band I do know all about having seen them at this same venue recently. This time around they were playing with a stand-in bassist (Tim Chambers, of Sister Shotgun) as regular bass player Martin Shepherd sat this tour out. The set they played was similar to that I saw late last year here, with singer Chloe ‘Skarlett’ Drinkwater once again doing without her guitar, concentrating on vocal duties. They were, to coin a phrase, hard, fast and heavy! Their material has definitely taken a turn towards the darker side of late, pretty much everything they did was out and out metal, though the bass-heavy sound didn’t do them too many favours, swamping guitarist Danny Oglesby (but not his drummer brother, Luke!) They still got a good reception from this crowd with an energetic set and some fun from Skarlett herself, posing for a few cameras aimed in her direction! It was the guys of Sumo Cyco who bounded on stage led by their guitarist Matt ‘MD13’ Drake, geeing up the crowd before launching into their opening number. That soon got the crowd bouncing, as singer Skye ‘Sever’ Sweetnam joined them, not exactly inconspicuous with pink hair and a black/white chequered jumpsuit! Their set was pretty unrelenting all night, with their music a sort of metal/ska/punk fusion designed to keep the crowd on their toes from first to last. It’s a lazy comparison to think of No Doubt (before their breakthrough) as a reference point, but one your correspondent grasped, having not heard a note from this group before they hit this stage! They don’t do any power ballads though, and this set was basically a workout for us on the floor. Occasionally ‘Sever’ joined us out front, she came off the stage and into the crowd numerous times, once going full ‘Joel O’Keefe’ and getting a drink from the bar mid-song, then slugging it on her way back to the stage! Throughout, the tempo was kept up by bassist Ken ‘Thor’ Corke and drummer Matt ‘Trozzi’. I first became aware of Bristol ‘party punk’ trio IDestroy around two years ago, via their bass player Becky Baldwin, who plays with multiple bands including DORJA, a band I’ve followed since their inception. In this outfit she is accompanied by drummer Jenn Haneef and singer/guitarist Bec Jevons, who also pens this band’s material. A lively trio with a nice line in upbeat, catchy power pop anthems, this release is their second EP and third release overall, following on from 2016’s ‘Vanity Loves Me’ and the ‘Annie/98%’ single of last year. The five tracks on this EP are all short and to the point, with the longest (‘Alcohol & Vitamins’) clocking in at a relatively lengthy 3:34. Built over a steady 4/4 beat and prominent bass line, these songs have all the usual hallmarks including ‘whoa’ backing vocals, guitars smashing in on the chorus and an overall sense of fun to the proceedings. ‘Lemons’ is a humorous song about someone who ‘ain’t no fun’, the theme being that whoever it is has ‘a face like you’ve been sucking on lemons’! The new songs will slot into their set easily, and will give their followers plenty to bounce around the floor to. IDestroy will tour the UK in the coming weeks as openers to The Men Who Will Not Be Blamed For Nothing, then play further shows in continental Europe. If you get the chance go along and experience some Pure Joy of Life! You got the immediate impression of ‘taking it to the next level’ for Walsall foursome Stone Broken upon entering the main L1 room at Chester’s Live Rooms. There was a backdrop, screens with their logo printed on them and big lighting clusters. That did leave rather a ‘cul-de-sac’ on the stage for drummer Robyn Haycock, though that wasn’t an issue for the two opening acts. Another pointer that this band are stepping up a level was the turnout; the place was already filling up nicely when openers The Bad Flowers took to the stage and just got busier as the night progressed. They had to open up the rarely-used balcony and it turned out this gig sold out on the night. With tours supporting both Glenn Hughes and Living Colour under Stone Broken’s belts, as well as inking a major-label deal late last year (they are now signed to Spinefarm Records, part of Universal), as well as support from radio station Planet Rock, the building blocks are all in place for this band to make the jump to bigger things. The band’s second album ‘Ain’t Always Easy’ has just been released by Spinefarm, and the label is also to reissue debut ‘All In Time’ later in the year. The Bad Flowers, a Cannock trio comprising guitarist/vocalist Tom Leighton, bassist Dale Tonks and drummer Karl Selickis, didn’t mess around when they took to the stage. Somewhat cramped for room in front of the Stone Broken backdrops and an array of bass bins at the front to provide a ‘platform’, they played traditional but stoneresque hard rock, thanks to Leighton’s fuzzy guitar tone and Tonks’ fluid bass. The real star of this band is however the drummer, he really powered things along with some mighty hitting. These guys are worth checking out if they play any gigs local to you. Following this was Jared James Nichols, whom I last saw at this place but in the smaller L2 bar area. He had a much bigger crowd to warm up this time and some new material, as well as a new bassist in Gregg Cash. Guitar geeks will have noticed immediately his use of an Epiphone guitar (also that he’d scooped out the neck pickup, leaving a cavity!) and guitar snobs will hopefully have seen that it isn’t the name on the headstock which matters, it’s what’s in the fingers. Playing ‘fingerstyle’, the man from Wisconsin gave a fiery performance with that Epiphone, backed ably by Cash on the bass and Dennis Holm on drums. Clearly someone steeped in traditional American-style rock, his cover of Mountain’s ‘Mississippi Queen’ went down well with this crowd. Stone Broken entered the stage like conquering heroes, cheered to the rafters from the moment they came on to the moment they took their bows. With a new album just released, they performed plenty from it but also found room for several of the favourites from ‘All In Time’. They found themselves having to pause to take in the cheers on more than one occasion, especially when singer/guitarist Rich Moss declared that they’d sold this venue out, and that their new album had made the midweek charts. ‘Thanks for putting us, a little band from Walsall, into the national charts’ he said. With their drummer effectively tucked away in her little cubby hole on the stage, the frontman and the other two lads (guitarist Chris Davis, bassist Kieron Conroy) were all over the stage and onto that bass bin ‘platform’, having to dodge a low-hanging stack of speakers in the process! They didn’t hang about either, playing 14 numbers in just over an hour and still squeezing in a brief drum solo for Robyn Haycock! This is the third time I’ve seen this band now, and they always gave me an impression of being influenced by numerous current American bands, especially Alter Bridge; they have that similar downtuned guitar sound, two axemen (one of whom is also lead singer) and quite a few singalongs not far removed from the early AB days. That perception was reinforced somewhat in the encore, when Rich Moss came back out alone, clutching an acoustic guitar. This was to perform ‘Wait For You’ (still their best song IMO) and the way this packed crowd picked up on it was so reminiscent of seeing Myles Kennedy do something similar with their own ‘Watch Over You’. The reception Moss and the band got throughout obviously delighted them, though his requests for us to ‘go crazy’ for closer ‘Not Your Enemy’ were not entirely fulfilled. What he’d overlooked was that this crowd was full of old rockers (many a similar age to your correspondent!) and sorry Rich, but our knees aren’t what they once were! The fact that bands such as this are pulling a crowd of people probably twice their own age rather than people of a similar age to themselves is something I’ve noticed at many gigs lately, and is a subject worthy of further discussion in a future blog post. Not everyone there was old enough to be their parents – I attended this gig with a friend and her daughter, who is the right age to be enthused by a hard working, hard rocking band such as Stone Broken as well as both their support acts. However if even newer rock bands are attracting a mostly 50-something crowd, one has to question how long this success can be sustained. Rich, Robyn, Chris and Kieron won’t care one jot about people’s ages as long as there are people there to see them of course but this sort of music, played live and with enthusiasm by younger performers, really ought to be reaching their own age group. I’ve a good idea why that is, but that’s for another post. I can’t speak for the rest of that sold-out crowd of course, but as one of those older fans what I can say is that so long as my legs hold out and my pocket permits, I’ll follow this band and plenty others for a few more years yet! Since leaving behind her days as a rhythm guitarist in a touring covers band, she’s branched out into several styles. She’s co-written songs in the punk and hard rock genres, and has written and produced her own material in a more chilled-out, and ambient style. In addition to all of that, she has been composing music for use in television, and has a full album in the can (recorded in LA with acclaimed guitarist Pete Thorn) for release later in the year. This EP came as a bit of a surprise then, her third such release in a little over a year. Described by its creator as ‘dark pop’, ‘Rust’ comprises five tracks, leading off with ‘Mystery Man’; a song previously released as a standalone download. This track features her use of the ‘Guitar Triller’, a device to strike the guitar strings rather than pluck them. The effect is apparent on the track, giving her guitar a jangly tone, somewhat ‘sixties’ in feel. The rest of the material is brand new; ‘Sailing’ is a mellow number with her breathy vocal over an ambient soundscape not far removed from her ‘Desert Wax’ EP; ‘Show Me Something’ is even more electronic, with beats and synth lines weaving over a deep bass line. ‘Heat’ is a slow-burner, starting off with a gentle guitar noodle, it’s probably the most chilled-out track on what is a fairly relaxed offering, with a particularly soft, seductive vocal just sticking out over the instrumentation. Final track ‘Lesson In Love’ (nothing to do with Level 42!) is the stand-out for me; beginning with a haunting synth tone (reminiscent of the opening of ‘A Clockwork Orange’ to these ears) it soon melds into another dreamy song with her mellow vocal over a string/synth effect. Holly is now developing a recognisable style; this EP has elements of both the previous two offerings, the dreamy soundscapes of ‘Desert Wax’ with some more conventional guitar and drums in the mix this time. Her voice is used as another instrument, just another colour in the pallette rather than being pushed to the front. If you enjoyed either of the two previous EPs you will like this one, just as with those two offerings it’s best listened to of an evening, with headphones if you have good ones (!) to get the most from that carefully-woven soundscape. All that said, as we have not heard her LA album yet, that is likely to be something completely different. Don’t assume her genre, as she says!